Taste the green gold of Sicily at Raffadali Pistachio Festival! Back again from September 21st to September 23rd the Raffadali Pistachio Festival, this year known as “FastucaFest 2018”. When it comes to Pistachio, no one can’t help but think of Bronte, certaintly one of the most famous pistachio’s producers in Sicily, but Raffadali, a small town in the province of Agrigento, boasts a long and interesting tradition linked to the green gold of Sicily. The Festival is also a showcase of excellence, which aims to protect, promote and enhance this wonderful and simply delicious product. A funny and super sweet event that are just waiting for you and your whole family! Have you already booked your Family holiday home in Sicily? The pistachio-tasting comes with a wide list of collateral events such as conferences, exhibitions, show cooking, and an exciting cake design contest. A path will be set up with lots of stands where you can taste pistachio-based sweets and dishes. 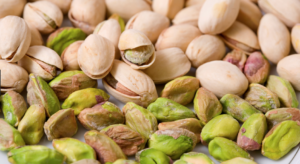 Raffadali’s pistachio is particularly prized for its aromatic and pleasant flavor and it is used in many pasta recipes, cakes, ice cream which are very popular and appreciated. You’ll get the chance to try all the raffadalesi pastry chefs’ original creations, which are real masters in the particular art of pistachio baking. Real delicacies, we can assure you it’s really hard to resist: from pastries to nougat and mousses, the amazing “nutella verde”, as well as first and second courses, such as arancini and sausage. In short: don’t make any other plans! Try new typical Sicilian products, you’ll get addicted in one bite!